I thought I'd never been to Lyng before, but as we drove into the middle of the village and parked outside the pub, I recognised it. Over the years I had often taken the first service bus of the day from Norwich to Walsingham, and Lyng was one of the villages where it stops. I had seen it in the quiet of early morning, or in the crepescular gloom of early evening as I made my way home. It was rather startling to see that the sun shone here, and that people actually lived here. The pub looked very fine, and there are little lanes through the backs of houses that lead to the church beyond it. Across the high street is a handsome old Primitive Methodist chapel, now a private house. 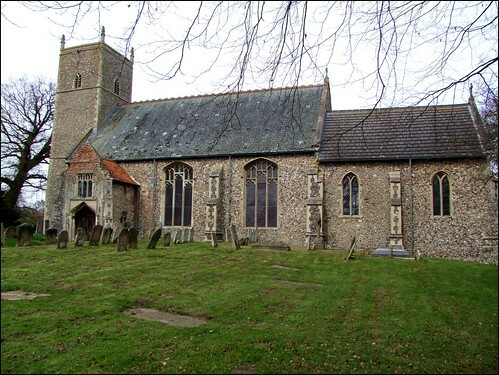 In medieval times, Lyng had two churches, but it was a single parish. St Edmund, out on the road to Morton, was the church of a Benedictine convent, but it fell into disuse at the Reformation, and is now no more than flint rubble in the middle of a field. In contrast, St Margaret is a fine building, if a curious one, because despite its textbook 15th century nave the church has a flavour of the 17th and 18th centuries about it - look at the tower and the gable of the porch. The perpendicular windows of the south side are huge, stretching almost from ground to roofline, and I think they must be 19th century renewals. The great treasure of Lyng St Margaret is a pall, or altar cloth, displayed in an alarmed case in the chancel. It was made up in the 19th century from at least two 15th century vestments which probably came from Lyng originally. Indeed, they may well have been worked by the nuns at the Benedictine convent. It is rather difficult to photograph, but the scenes on it include the Crucifixion flanked by the Blessed Virgin and St John, a six-winged angel standing on a wheel, and a king with an axe who I think must be St Olaf, a popular late medieval Saint in Norfolk. Despite the lack of a clerestory, the interior of the church is bright, warm and full of light. What you can't see as you walk up towards the south porch is that the chancel is offset hard against the south wall of the nave, creating a curious effect from inside as you look east. I can think of several other churches in East Anglia like this, and in several of them it is a result of the arcade of a north aisle being removed, and the nave widened. But I think that the nave at Lyng is not wide enough for this, and that what happened here was that the nave was rebuilt on a grander scale in the late medieval period and, although there were plans for a similar rebuilding of the chancel, this never happened. Instead, the chancel was rebuilt about a hundred years ago on its original alignment. The font is a familiar 13th century Purbeck marble bowl set pleasingly on a collonade, looking well in the stone pamments of the open western end of the church beneath the modern gallery. Otherwise, not much survives of the medieval life and liturgy of this place, but there is an intense sense of the numinous, of a place which prayer has made valid. Overseeing all of this is the rather imperious 1968 figure of Farrar Bell's St Margaret, set in the otherwise clear glass of the east window. The grinning dragon curled around her feet lifts his head deferentially, and seems more like a pet asking to be stroked than a peril needing to be defeated.